Kathryn and her family live in Ontario where she and her husband work for a non-profit charity and have a combined household variable income of approximately $32,000. She has a passion for personal finance and helping others live well on less. She volunteers her time as a financial coach, meeting regularly with ordinary Canadians whose goal it is to reduce their debt, increase their savings and learn to live within their means with simple, easy tweaks to their spending and savings. My husband and I are strong believers in the theory that says do what you love and the money will come later. We do what we love, but working in non-profit isn’t exactly lucrative. We had some choices to make once the kids came along. Should one of us move into the profit sector to make more money? Can we stretch our money even further so we can save for the future, provide for our family, and live well on less? Our biggest expense was our housing which was a fixed price. Our second biggest expense was our food budget. If we could dramatically reduce our grocery bill, we could afford to keep doing what we love. This is how we feed our family our family of two adults and two school age kids on $100 a week. Make a menu. At the end of the day, we always know what we’ll be having for dinner that night. Most of the time, a few minutes in the morning to throw a bunch of ingredients in the crock-pot or set something out to thaw is all it takes. When we get home, there is no temptation to eat out or order in. We keep the menu posted on the fridge so if one person gets home before the other, they know what to make. Do the math. Look at the unit prices and consider convenience food with an open mind. Sometimes it is less expensive to buy convenience food. Sometimes it isn’t. I’ll buy President’s Choice lasagna or Chicken Pot Pie (which is way better than I could ever make) and know I couldn’t make it from scratch for that price. Eat the good stuff. We eat lots of fresh fruit and vegetables. The fridge and fruit bowl are well stocked with high quality fresh foods. We rarely buy chips or pop. If we’ve only got $100 to spend on food, I don’t want to waste it on nutritionally empty food. When we do buy junk, we buy the good stuff. Our budget includes dark chocolate and the occasional bottle of Merlot. If we buy juice, we buy 100% juice. Shop once or twice a week. I do my main shopping once a week and aim to spend about $80. One other time in the week I spend the remaining budgeted money on anything we need before the next big shopping, usually a few missing ingredients and a re-stock of fresh fruit and vegetables. Make a list and stick to it. I have met with more people during my volunteer work as a financial coach, that confess to grocery shopping by wandering up and down the aisles to see what catches their attention. Companies hire people with PhDs in psychology to format the store in such a way to optimize temptation. The number one way we keep our grocery budget down is to make a list and stick to it. Use a calculator. Our budget is $100 a week. I have no way of knowing how close I am to the goal unless I keep track along the way. The easiest way to do this is with a calculator or a good old-fashioned ‘clicker’ counter. Then when we reach our set amount, we stop or begin ‘reverse shopping’ (putting back the things we don’t really need). If you bring the kids, put them to work. This clearly works better with school age kids. My kids know all about unit prices and how stores market to children. I try to go alone when possible but when the kids come with me, I put them to work. One of them is in charge of calculating how much we’ve spent so far. The other one is in charge of unit prices. When they are working with us in meeting our family goals, it’s a lot less likely they’ll ask for something that’s not on the list. It also makes the whole ‘grocery shopping with kids’ thing a much more pleasant experience when they have a valuable contributing role. Consider generic. I confess, when it comes to peanut butter, Kraft is the only one for me. However, with many items, there is very little difference in taste between the name brand and the generic. In many cases, the name brand company is producing the generic and it’s the same product with a different label. If you don’t like it, go back to what you like. Food should be about quality healthy ingredients that taste good. It’s not worth sacrificing flavor to save a bit of money. You might be genuinely surprised to find you like the generic brand better than the original! We don’t buy in bulk. (Gasp!) In fact, we quit going to Costco. When we bought in bulk, frankly we ate in bulk and wasted in bulk. Now that we’re buying reasonable portions, our grocery bill is manageable and we’re wasting very little food. When I sat down and did the math I realized that for us, we simply spent more money on food when we shopped at Costco. Pay cash or track it. I know, I know, we all love our cash back and our points. We’re addicted to credit card rewards. I collect PC points and have had almost $1000 in free groceries since switching to PC Financial in 1998. It works for us because we stick to our goal. I have found for most people, paying for their groceries with cold hard cash is the only way they can stick to a food budget, at least in the beginning. It takes some getting use to and yes, you’ll sacrifice the points. Even if you did it for a month, you could reduce your food budget considerably. I track everything we spend at wesabe. When the money is spent, it’s spent. Eating well on less isn’t about making huge sacrifices or giving up your favourite things. It’s about making a plan, buying just enough, using what you have and choosing quality over quantity every time. 1) Use everything you buy. Bones turn into soup stock for example. 2) Sometimes sales come along that are too good to pass up. On these occasions we exceed our budget if a regular item is on a great sale. We deduct this amount from future weeks. 3) Meat is expensive. We decided, to help meet the budget, to eliminate meat intake on some days. There are lots of good resources on how to meet nutritional needs without meat on the web. 4) Learn to bake. It helps to know what goes into prebaked items as well, from a nutritional perspective. This would be a lot more useful if it included actual purchase details. None of these suggestions would lower our grocery bill that much. In terms of actual purchase details, it really depends on what is on sale that week. Deciding what to buy is really up to each individual family and what they like and what happens to be on sale that week. The important thing is to make plan and as Jesse mentioned, to use up everything you buy. We get a local paper every Thursday. This is packed full of flyers, especially the grocery stores in our area. We have 5 that are all within 1 km of our subdivision. I save a considerable amount of money by planning my meals, snacks, drinks, and vege/fruit purchases for the week on the flyer specials. And I always try to eat healthier (which I have found is typically more expensive), and this allows us to do it for less. Also, because I buy what is on sale or discounted, we are able to experience variety and become less bored with our food choices. Examples of winning deals: High end steaks 50% off and already individually wrapped. We bought a month’s worth of angus beef and froze them. Now we have no need to buy beef for a while, and we get to eat the “good stuff” for less than the price of the cheap stuff. Breads marked down 50% beacuse they are due to expire mid week, we’ll eat it before then. It is hit and miss on the fresh fruits & veggies, some fridays it’s packed with new stuff other Fridays it’s slim pickins! All in all my stress level has DECREASED shopping Friday evenings as the store is literally ours. No line ups and still plenty of staff. my girlfriend and i spend about $350 on groceries a month. i think this is almost inline with $100/week for a family of four (since kids eat less). Great points Dane. We belong to our Local Organic Food Co-op in our area. We get a big box of all our fruit and veggies for the week every week from May – Oct. In the winter months, we rely more on grocery store items but we try out best to stay as local as possible. On that note, here is some other food for thought. I found these photo essays fascinating. These are great tips, Kathryn. It’s hard to feed a family healthy meals on a budget but it sounds like you have the basic tips nailed. I find that investing a little time in planning ahead saves me the most, sticking to a list, along with having a plan for leftovers. I think the biggest waste in the typical food budget comes from both impulse purchases at the market and not using up what you have. Also, COUPONS help reduce costs further. I made post on how I managed to get over $100 worth of groceries for a major fraction. If I am allowed to link, here is the post http://bullsbattlebears.com/?p=383 ,otherwise please remove if its not allowed. Don’t forget about leftovers! Things like pastabakes or stews are great for lunch the next day, and you’ll make your coworkers jealous. My next strategy is taking a calculator with me to the supermarket. I realized that doing the maths mentally is no good. That’s extremely impressive. I probably spend about $80/week just on myself. this also includes food for lunch since I brown bag everyday. Either way without buying in bulk and feeding for multiple that is extremely impressive. I marvel more about the fact that $32k/year is all that is required to keep the whole household running! I’m budgeting $36k – $42k for our retirement (today’s dollars) and we won’t have kids, mortgage, RRSP/RESP/TFSA contributions, etc., etc. Ok, the two of us make over 100k/year and there’s only *two* of us so maybe this doesn’t apply but cmon, make a few extra bucks, get some real jobs. Life is too short to worry about whether you need one peanut butter over the other. Buy healthy stuff that you want to eat and get out of there as fast as you can. Do you really want to spend that much of your life at the retailer and with a calculator (cmon)? Way to go! I am a mommysaver as well. You are awesome! I was just wondering do you include items like laundry soaps, tissue paper, tooth paste etc. in the budget or are they separate? If they are separate how much have you allocated to these items. Thanks for the great helpful hints. We have found that buying gift cards gets us the points we want while still limiting the $$ just like cash. You know what’s a great idea… get some friends/neighbors together and go to Costco, Sam’s, etc. and buy bulk items. You can split the cost and divide up the food. I read about a family that does that in the Wall Street Journal. H&H ~ I don’t include laundry soap, toothpaste, etc in the figures. I generally either wait to buy those on sale somewhere, buy them with free PC points, or get them at Walmart where the prices for cleaning supplies / personal care items tends to be a lot lower. We are pretty ‘green’ around here so we don’t use up much consumables. We use cloth napkins and j-clothes rather than paper towels. We also have front load washing machine which hardly takes any laundry soap. Your idea about the gift card is one of the best I’ve heard in a long time. You are absolutely right. It solves the issue of the ‘points’ while still forcing the issue of the budget. I’m going to recommend this to the people I meet with who have trouble keeping to a budget but are reluctant to give up their credit card points. Great idea! First off, I am enjoying reading through these comments in addition to the blog. My wife and I, both in mid-20s, do all of our grocery shopping at Walmart. About 6 months ago we decided to start eating healthier because…yada yada ya…I will spare you the details. 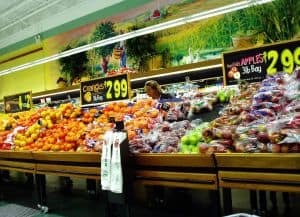 Anyways, our method of grocery shopping is simple: make a “loop” around the store buying fresh produce, fresh fruit, meat, and dairy items and avoiding the aisles—which mostly consist of frozen/boxed/bagged items. I must admit there are exceptions to that rule—bread, pasta, cereal, and the healthy work-week frozen lunches—but for the most part this method of shopping has been very effective. Note: For those exceptions we use a basket to gather the items so we don’t start throwing stuff in the cart. When I explain this to most people they immediately resort to the “fresh produce/fruit is way too expensive” excuse; however, the cost of the impulse snack items (even though they aren’t on that grocery list) more than offsets the cost of buying “fresh”. By using this method we avoid the soda/pop/coke, chips, sugary juices, ice-cream, etc.—all of which were common items pre-loop shopping days. +We are saving about 20% a month (about $50-$60) on our grocery bill. +My wife’s cholesterol dropped 40 points in six months (I stayed the same, but I was well within the “desired” cholesterol range to begin with). DYK? …Although I not a nutritionist or anything, did you know that boiling your vegetables actually just “boils” the nutrients right out of them? That’s why we now steam our vegetables—much more tasty now, too! Another good veggie cooking method is using no oil or butter and pan roasting them in a good heavy stainless steel pot on low heat. On an electric stove I use “2” on the knob and it takes about 30 minutes with the lid on. No stirring required so you can set it and forget it. I’m a believer in bulk. You just have to be careful at Costco, because it is quite easy to get carried away with things you don’t really need. Dry noodle soups are very cheap in bulk, and work well for lunches or even a dinner side dish. Cereal, sauces/condiments, and certain baking goods are usually good things to get there. For canned soup, Costco’s prices aren’t that good, so I watch the flyers for a cheap price and stock up. Same goes for anything that preserves well: wait till it’s cheap and then buy lots. Scanning the flyers is worth it! As jesse said, meat is expensive. But so are meat replacements, and besides, I love meat and could not give it up. So how do you save on meat? BULK! Get those warehouse packs and split them up when you get home. Every couple months, my Mother and I jointly place a huge meat order with the butcher at her local grocery store (Sobeys). The butcher will divide everything into the specified size packages, but still gives you the warehouse pack pricing. And usually a 10 – 15% discount off the total as well, because our order is so big! Of course, this requires that you have a large freezer, but it sure saves a lot of money! My final money-saving grocery tip: shop on days where you get a discount off your total purchase. For example, the Safeway and Sobeys stores in Edmonton give you 10% off on the 1st Tuesday of each month, and at Save-on-foods it’s 15%. I don’t know if other cities have this promotion. Generally the sales aren’t as good in the first week of the month, but there are some things that never go on sale so this is a good time to get them. If Chinatown is close by where you live, get your fresh produce there. I buy fruits and vegetable mostly from there because it’s a lot cheaper than buying from supermarkets. (eg. Red/Orange/Yellow bell peppers is 0.79/lb compare to 2.49/lb at Metro or Loblaws) And meats? Check out Korean supermarkets, the meats there are generally a lot cheaper than the super market as well. They are freshly packed and sometimes in bulk with real good prices. Thanks Kathryn for your ideas, but I do agree, some ideas menu wise would be great. The planning for the evening meal is never the hard part, but keeping to a budget and packing your childrens’ lunches seems to be harder to combine into a budget. Anyone have ideas or resources? I like the idea of including the children – teach them to be independent but also maybe take away a little of the fear about budgets. Ray – your comments are just insensitive. We went from two incomes to one – not by choice and are looking at a forced retirement in just over a year. Would love to find those two high paying jobs that would cover the cost of childcare – that is if I could find childcare in the area. I have been feeding a family of 4 for almost a year for $200 / MONTH. And we eat healthy, our fridge/panry/freezer is full. I do use my stock pile and the do redeem at Zehrs/Shoppers drugmart using my points when they have good deals to make our $ go farther. I feed a family of 5 -with one big eater- for about $200 a month. The key words are beans and Ramen noodles. I make tea for us to drink and don’t buy any soda.